Owing to intense competition, companies operating in the global pressure sensitive tapes market are ploughing more resources into research and development activities aimed at the development of new product varieties to gain a stronger hold on the market. Rise in stringent regulations surrounding the use of plastics and other non-biodegradable products in the packaging industry has shifted focus of companies on the development of biodegradable products, observes Transparency Market Research in a recent report. This trend is expected to have a deep bearing on the way the market develops in the next few years. According to the report, the market, valuing at US$53,906.5 mn in 2015, is estimated to rise to a revenue opportunity of US$96,105.0 mn by 2024 by exhibiting a CAGR of 6.7% between 2016 and 2024. The market is expected to rise to a valuation of 69,745.2 mn sq meters in terms of volume in 2024. Of the key product varieties in the market, the segment of carton sealing tapes presently accounts for the dominant share in the overall market. The segment held nearly 60% of the market in 2015 in terms of volume and continues to expand at a promising pace. Over the report’s forecast period, the segment of specialty tapes is expected to emerge as the segment with the most promising growth prospects in terms of revenue contribution to the global market, exhibiting a nearly 7.7% CAGR. 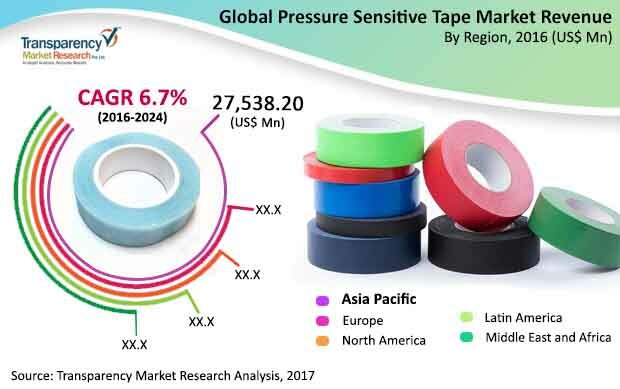 Geographically, the market for pressure sensitive tapes in Asia Pacific is expected to account for a significant share in the global market in terms of revenue as well as volume over the report’s forecast period. Based on revenue, the market is expected to expand at a 7.3% CAGR over the forecast period, thanks to the thriving packaging sector. One of the key factors driving the global pressure sensitive tapes market is the steady adoption of these products in applications across the automotive and electronic devices industries that traditionally used screws, fasteners, rivets, and bolts. As these industries focus more on the development of lightweight and more compact products, the use of a variety of pressure sensitive tapes has become an apt and plausible option owing to impressive results in terms of strength, esthetics, and form-factor of the joint and the final product. The market is expected to benefit massively from the thriving electronics devices industry, wherein the trend of miniaturization, especially in products such as smartphones, tablets, and wearables, is generating promising growth opportunities for pressure sensitive tapes. The thriving packaging industry and the vast rise in stringent regulations surrounding the industry’s use of vast volumes of non-biodegradable products, which are often directly left for dumpsters once packages are opened, are also expected to emerge as key drivers of the market. However, the fluctuating costs of raw materials could negatively impact the growth prospects of the market to a certain extent.